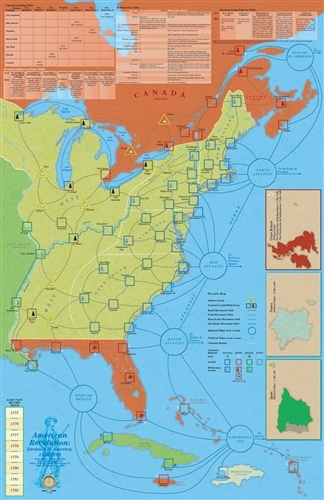 The American Revolution is a bit of a strange duck when it comes to wargames concerning it. In the computer world it is hardly represented at all, however in the chit world it is well represented in both tactical and strategic games. Historically, the British won almost all of the large battles without ever coming close to winning the war. The American forces kept rising up like a Phoenix to force the British to play a losing game of whack-a-mole. In reality, because of the time period and the length of time and mileage, the British could never really win. Their only hope was for a negotiated peace based upon political incentives to bring the colonies back to the fold. I, for one, believe that General Howe and others thought that a few hard whacks would make the colonists see reason.When this didn't happen, they were at a loss of how to actually win. But I digress; back to the game. The British player is presented with the most strategic choices. He can go for broke and try to subdue the colonies all at once, or like Clinton and Burgoyne, use the British anaconda to swallow one piece of them at a time. The American player is really only represented with the choice of attacking Canada other than that he mostly reacts to the British players' moves. The British player, at first or until France and Spain get involved, with his naval power can decide when and where he will descend on the colonies. He can bring overwhelming force to any point on the map he chooses at the beginning of the war. So what is the game play like? 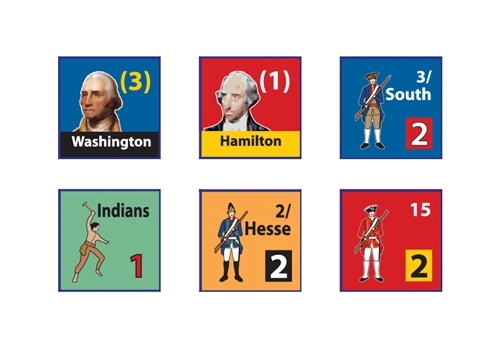 On the first turn the American player has the initiative; after that the player who commits the higher number of campaign markers has the initiative. On turn one, the British player also pays twice the normal amounts for mobilization and campaign markers. The second phase is the 'Political Phase'. Both sides add up their political points for the areas they occupy. The third phase is the 'Mobilization Phase'. The first player uses his political points from the last phase to build units or buy campaign markers, then it is the second players turn. The fourth phase is the 'Rabble Rousing' phase. 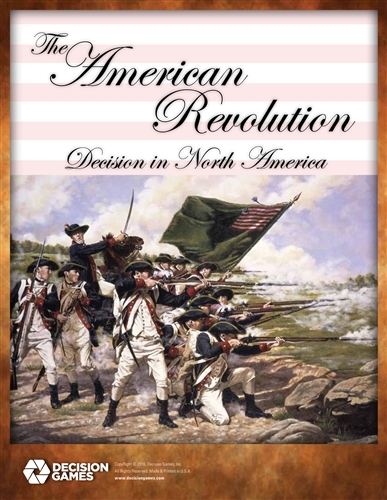 Here you can commit markers to the three 'rabble rousing' tables: American revolutionary progress, colonial loyalty, and European balance of power. The fifth phase is the 'Campaign' phase. The campaign phase is in turn split into three parts: first, second, and third. The first phase is used for normal movement and then combat. The second and third phases are used for forced march movement and the combat that results from it. The six phase is the 'Supply' phase. This is split into two parts: forage and enlistment. In the forage phase the player that has the initiative checks his units for supply, and then rolls a die for each unit that cannot be supplied. On a roll of one to three the unit is eliminated. On a roll of four to six the unit survives. The seventh phase is the 'Victory' phase. You check for a sudden death victory, and if neither side gets one you continue to the next game turn. This is just a synopsis. There are rules for: militia expeditions, overrun, frontier warfare, massacre etc. The game turns are yearly so it is a fairly fast paced game, although each side does have many choices available for each turn. You can choose to play with the optional rules which would include the use of fortress, siege, and partisan markers.The game play is pretty free-wheeling, meaning that it is fairly easy to lose points and areas with a little bad luck. Your plan may make it look like you are on the verge of victory, and the next minute everything blows up in your face like an over charged musket. As is stated in the 'designer's notes', the core of the game is the campaign markers. The random picking of the campaign markers means that you, as the player, might have to drop the plan you had in place, and rethink this year's turn all over. You also lose half of your campaign markers at the end of each turn. Again, as is stated, you may actually pull a campaign marker that can only be used by your opponent. You can choose these markers to be one of the ones you let go at the end of the turn, or you can keep it in order not to let your opponent use it. The campaign markers come in three flavors: action, rabble rousing, or tactics. As I stated, it is a fast paced game, especially with its one year turns. The counter mix is small, so other than the map size the game's footprint isn't large. The game plays out quickly, and with the sudden death rules it could be over even quicker. The best bet, playing as the Americans, is to just remain alive and to work toward European intervention. The added troops and navies of the French and Spanish forces help to really put the British in the skillet with no idea of where to jump. The British player is naturally going to go for the opposite, and try and keep the other countries out of what he considers as his business. The plan for the British to slowly engulf the colonies bit by bit hasn't really been seen to be that effective. The game plays like a boxing match between a heavyweight and a middleweight. The middleweight can strike hard and often, but has to remember that one punch from the heavyweight can end it all. As the game goes on, the middleweight gains muscle and increases in size, and can also call two friends in to help him fell the giant.